CG Vyapam Recruitment 2019 - Apply Online for Lab Technician Posts (WLT19) in Chhattisgarh on Direct Recruitment. Online Applications are invited by CG Vyapam: Chhattisgarh Professional Examination Board (CGPEB) from 08 Feb 2019 to 24 Feb 2019 till 11:59 PM for 4 vacancies. B.Sc. in Mathematics, Chemistry and Physics from recognized University. Eligible candidates may apply online at CG Vyapam's website (direct link is given below) from 08 Feb 2019 to 24 Feb 2019 till 11:59 PM. Candidates log on to http://cgvyapam.choice.gov.in/. Go to "Registration" & Select the desired post. CG Vyapam Recruitment 2019 - Apply Online for B.Ed/ D.El.Ed. Entrance Exam 2019 in Chhattisgarh. Online Applications are invited by CG Vyapam: Chhattisgarh Professional Examination Board (CGPEB) from 05 Apr 2019 to 28 Apr 2019 till 11:59 PM and Examination to be held on 07 Jun 2019. CG Vyapam Recruitment 2019 - Apply Online for 14580 Lecturer & Teacher Posts in Chhattisgarh. 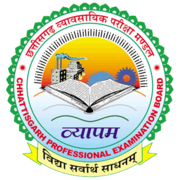 Online Applications are invited by CG Vyapam: Chhattisgarh Professional Examination Board (CGPEB) from 16 Apr 2019 to 16 June 2019 for 14580 vacancies. CG Vyapam PAT/PVPT Entrance Exam 2019 - Apply Online for PAT Entrance Exam 2019 in Chhattisgarh. Online Applications are invited by CG Vyapam: Chhattisgarh Professional Examination Board (CGPEB) from 29 Mar 2019 to 21 Apr 2019.